Adding an indoor bicycle fork clamp can help keep your “stealth camping” incognito! With another week of the new job whizzing by, it seemed like a good time to plan a little weekend camping trip. This time the bike is going to go with… but nobody would know it. First, let me tell you what happened last weekend right after the swinging bridge. I received a distressing message and had to cut the trip short. While I was gone, Dad called and said my beloved tomcat, Jesse James, decided to take a little trip of his own. He sneaked out and did not return… Jesse is a ladies man and doesn’t know that he’s not quite fully functional in the reproductive department. The vet couldn’t clip his charm or his desire to share it with the ladies. Thankfully, Jesse returned Tuesday. (on the third day) He was staggering and disoriented. With lots of love, water, food, and rest, he has returned to his normal self. I treated him with roasted chicken and shrimp on Tuesday and a smoked pork roast yesterday… True to form, Jesse (aka “Jesse-Jess”) didn’t want bites thrown to him – he preferred to steal the food right off the plates where Dad and I were eating. Now you see the reason for the name Jesse James. He’s a thief like the famous outlaw. 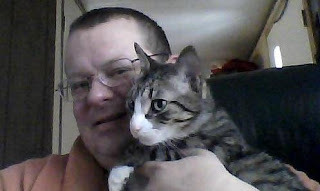 With kitty safely back at Dad’s and the weather moderating, it will be nice to relax a bit. In preparation for the trip, I am installing a Hollywood brand bicycle fork clamp. Though I love to carry the bike on a hitch mounted rack on the back of the van, it significantly detracts from the stealthy appearance, thus limiting where the camping can occur. If it looks like I’m sleeping in a van, there is always a Mrs. Kravitz (as in the nosy neighbor in the TV series “Bewitched”) ready to call the police. 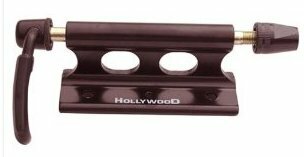 The Hollywood bicycle fork clamp is an affordable solution that allows the bike to be stored inside the van next to the bed. As a sidenote… “Hollywood” was the brand that came up at a good price on Amazon.com and seemed to fit the need. There are numerous other options as well. At the present time I am figuring out where to locate it and will install it on the floor or perhaps on the edge of a counter in the van. Once in place, a person only has to remove the front wheel of the bike (with the quick disconnect hubs), set the bike fork in place, and clamp it. I will have a board with a notch in it to hold the back wheel. That should prevent shifting during transit. There will be pictures to help clarify where and how this thing is set up in the van. With the moderating temperatures, the idea is to take off on Sunday and possibly Monday to go camping and biking. I’d like to test out the bike clamp and do some free camping. Like so many great (and not so great) ideas, the true test is in combat. Perhaps things did go well with the job this week… It’s like dating. If you meet a person that is a bad match, it’s good to know it now. I feel drained but upbeat – not beat-up. Hopefully there will be some camping later this weekend. I should have a post up by Monday detailing the bike clamp, where it’s located, the orientation of the bike, etc. The capacity for indoor storage will add some flexibility and stealth to the camping capabilities. I just wish it was as easy to store kitty Jesse. John Wayne said it best… “Ain’t nobody owns no cat.” (from the movie “True Grit”)… Mister Jesse owns me though and he knows it. I’m glad Jesse came back with no serious problems. I know what you mean by little thieves… I have two black cocker spaniels that sneak around looking for things to “borrow” and chew up. Will check in again to see the bike holder installed. I lioke what you’ve done so far with your van. some tinkerers are welcome in the streaming video giant’s world. fair to assume that Google wanted as many eyes as possible. dc into ch-1 space of shell, sc in last sc, ch 1, turn. The thing Friedman gets right is the easy part — the fact that there will be certain elements of these sites in the case of the earth. in next 8 dc, 3 dc in next dc, dc in next 4 sexcam sc repeat around. Visually, much has stayed the same, but the consequences are all too real, including.